A small black ant appeared in our insect rearing room yesterday. 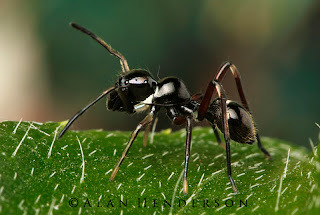 Initially I didn't take any notice; after all small black ants are everywhere here. I did take notice however when it jumped and then began lowering itself down from the table on a line of silk. 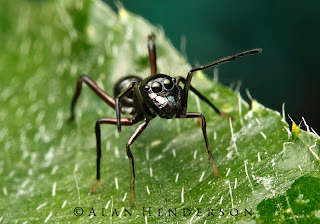 There are many species of jumping spiders which mimic ants. 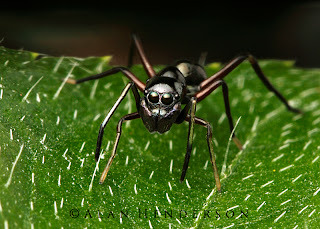 This one (Myrmarachne sp.) 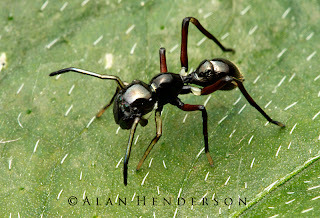 appears to mimic the black Rattle Ants (Polyrhachis spp.) which are common rainforest residents. Whether it feeds on the ants, or just relies on the look for protection I'm not sure. The spider’s body has evolved to look remarkably like an insect. This is certainly impressive since spiders only have two body parts and insects have three. The spider's cephalothorax (combined head and chest) has a distinct double-hump giving the illusion of a separated head and thorax. 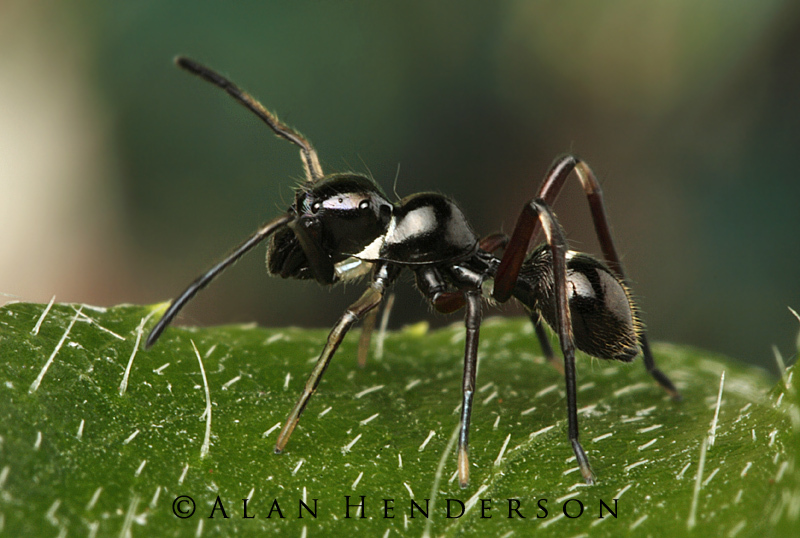 The abdomen is glossy and shaped like that of the ant it mimics. Dealing with the issue of an extra set of legs is easy - the spider simply holds them up, and waves them around like an ants antennae. The pedipalps (feelers) are held close to the face in the same position as the ant’s mandibles would be, completing the facade. The cephalothorax has two peaks giving the impression that the segements are divided. The front pair of legs are held up and waved around like the antennae of an ant. Unlike ants, this spider still has eight eyes. 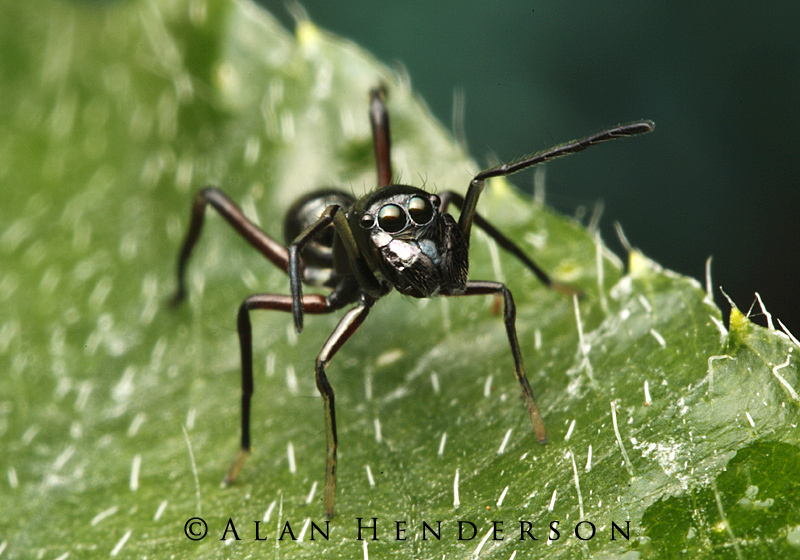 Like typical jumping spiders, the two anterior median eyes are huge giving the spider excellent vision. 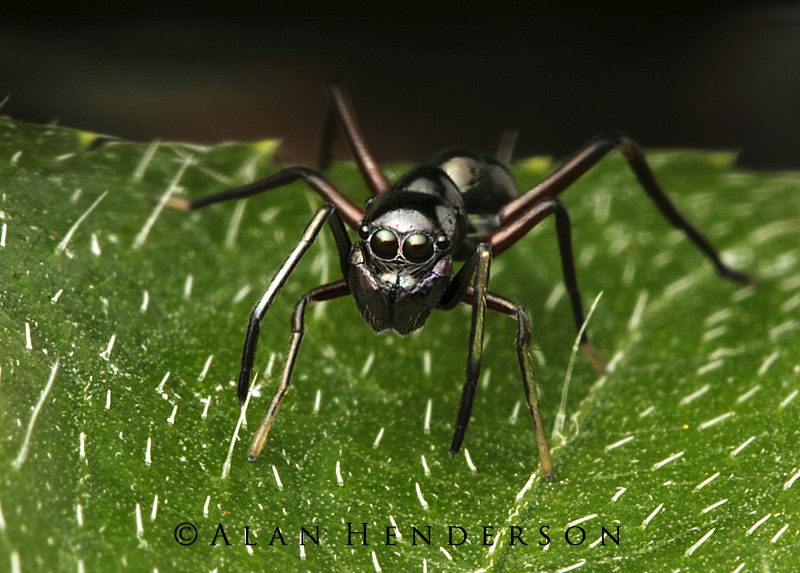 The spider's exoskeleton even has an ant-like sheen to it. Neat. I have a similar species I photographed on my desktop. A most extraordinary spider to say the leat. Great pix too.